Published on September 8, 2011 in Career Limiting Moves, Career Management Tips, Leadership, Mistakes To Avoid, Office Politics and Team Management. 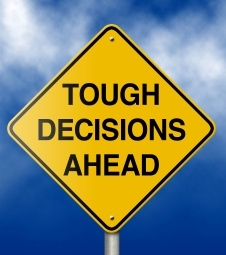 0 Comments Tags: Decision Making, Leadership, Tough Decisions. You might have noticed a theme in the last few blog posts – toxic staff… You might think I am anti “employees”, but you’d be wrong. The problem does not lie solely with staff, but with who hired them in the first place. Once someone has been hired, it’s increasingly harder to get rid of them, which is why you need to get rid of them as soon as you realise it’s the right decision. I see it over and over again – toxic staff destroying small businesses. Case #1: A software company had an unproductive ‘receptionist’ who didn’t want to handle a 50% increase in sales. Instead of moving her aside (and possibly getting rid of her), the owner CHOSE to keep her on. Within 12 months, sales went from a robust +50% crashing to an unprofitable -20%. The secretary was then happily doing less and getting paid more with her annual CPI-based raise. How does that make sense? Case #2: Service business needs to have field staff convert sales as part of their job description. Several field-based sales strategies and dedicated tools are developed tested and refined to maximise ROI on client call-outs. Over 6 months, these are dropped by staff because they unilaterally decide they don’t want to be “in sales”. Sales plummet 40% and field staff go from full-time work to part-time schedules. Everyone loses. Case #3: Consulting company gets online strategies humming with more leads and contracts than ever, tripling sales. Now comes the challenge of delivery… No one steps up to take the lead. Consultant now working 80+ hours/week because she can’t find anyone willing to take up the slack and increase their salary by $50,000+ because they either have no drive or no time availability (external commitments she knew about when she hired them). Because she never hired for future growth, eventually sales slip back down to essentially a salary with marginal tax benefits. She should have kept her “real job” – at least then she wouldn’t be burdened with the administrative headaches! What are the lessons to be learned from this? Hire the best who will get you from where you are to where you want to be. Once you hire them, train and develop them as much and as quickly as you can. Get their buy-in, don’t just give them FREE training, seminars and programs. Pay them according to their RESULTS, not the time and effort they put in, because that reinforces and rewards unproductive behaviour. Get rid of unproductive staff as soon as you can and hire BETTER replacements based on lessons learned. Have the courage to make the tough decisions – NOT making a decision is a decision made by someone else. The saddest part of having poor (or terrible) staff is that they eventually leave and that’s when it hits home… How much damage they’ve done – by then it’s too late.